UK ferry and shipping freight operator P&O said it will shift the registration of its UK vessels to Cyprus ahead of Britain's departure from the European Union, in part to keep its tax arrangements in the bloc. "In advance of Britain leaving the European Union on March 29, 2019, we undertook a review of the flag status of our ships on the English Channel," a P&O spokesman said in a statement. "For operational and accounting reasons, we have concluded that the best course of action is to re-flag all ships to be under the Cyprus flag," he added. The spokesman said Cyprus was among the world's leading flag registries, "resulting in fewer inspections and delays". He added the move "will result in significantly more favourable tonnage tax arrangements as the ships will be flagged in an EU member state". "We have no plans to make any other changes, including the terms and conditions of any of our seafarers, as a result of the new arrangements." Such a taxation system like the EU's allows shipping companies to pay corporation tax based on the tonnage of their vessels rather than on profit. Since then, Britain has awarded contracts worth more than £100m in total to three shipping firms to provide extra ferries, comprising French firm Brittany Ferries, Denmark's DFDS and a new British company Seaborne Freight. 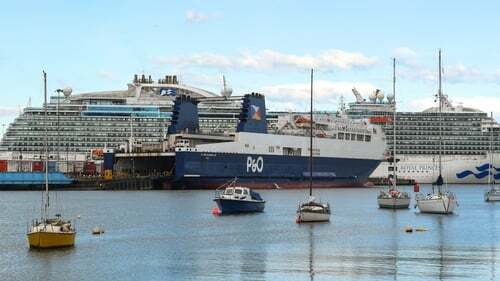 When asked today if P&O could provide space on ships if needed by the government, the company declined to comment.